If you are a movie junk, one of your biggest dreams would be owning your own movie house. You can watch newly released movies or old films that you enjoyed when you were younger. But building any structure nowadays costs a lot and that can really drain a huge sum of your savings. Do you know that you can have your very own film house under the roof of your home? By using home theater projectors you can watch your favorite movies with your family and friends without putting your feet out of your doorstep. And most importantly, you can have a movie marathon with unlimited buckets of popcorn. You will notice that there are a lot of projectors being sold in your favorite specialty stores and various websites and that is great, for you can easily compare the price and specifications of each projector. This guide will help you buy the right one that you need. Your room size: It is very important to determine the room’s size where you are planning to place it your projector. Typically, projectors have throwing power to a screen of 1.5 to 2.5 meters, but not to worry if you have a smaller space for there are models that have a 100-inch projecting power and if you have a larger room there are also projectors that have a power of 2.5 to 4 meters. Whatever your room size is, there is a projector that is perfect for it. Picture Resolution: Depending on your preference or room size, projectors have different picture quality. There is the standard 1080 HD and 4k Ultra HD but if your movies or games that are available in 3D, there are models that are also capable in projecting 3Ds. Wires: Are you a neat freak and seeing wires all over a room makes you uncomfortable? 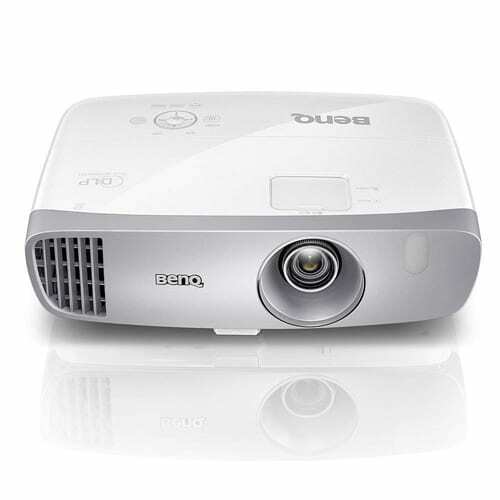 Do not worry for there are also wireless projectors that you can easily connect to a video source. 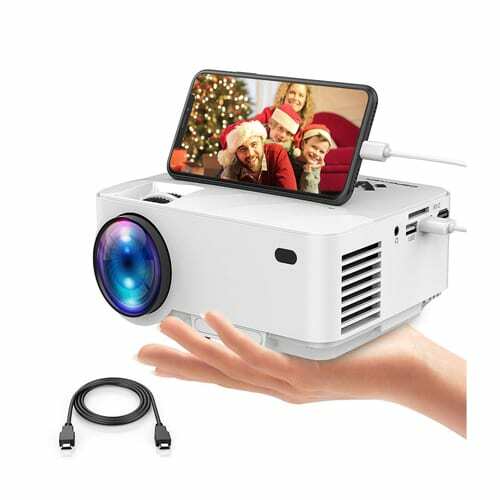 Lens shift projectors: It is possible that the wall across where you will place your screen does not have enough space for you to put a projector. The lens shift will allow you to project an image or a video in different positions while the projector itself is stationary. Thus, you can place it to the sides where there is an available space. Brightness: The light output of a projector greatly affects your viewing experience. You may want to project a movie on the screen at daytime and watching will be more difficult if your room is not dimly-lit. Choose a projector that has higher brightness if you want clearer and brighter video projections. If you are a gamer, you would understand the struggle of being squashed by people who want to watch you play. If you have a lot of audiences or want to showcase your gaming skills, you would need a reliable projector. The brand of this projector is very well-known for years so you can trust that this is durable and made of high-quality materials. The control buttons are easily accessible and understandable on top of the unit. This has a 1080p resolution and has a brightness of 2,200 lumens. It has SmartEco technology for conserving energy. It has a throw ratio of 1.15-1.5. Lags and delay in games and movies are very minimal. The keystone adjustment let you place it on the side without ruining it is displaying. It is the best projector under $1000. Its bulb burnt out after using it for 100 hours. This is the best choice if you are limited on a budget with its price around $600. a good advice is to let it rest for an hour or so after using it for hours so the bulb will not give up anytime sooner. Are you looking to buy one from the best-rated projectors by recent buyers? Look no further for this might be the projector you need in your home. This projector can display videos up to 11 feet without losing the image quality that is perfect for big rooms or on a long, narrow space. It is also compatible with a wide range of gadgets so anyone can really connect to it. This has 2 HDMI ports. It has a MHL-enable support for charging and mirroring your gadgets. It has 2,500 lumens of brightness and color. This has a good projection even used in midday. It produces great colors whether in bright or dark scenes. Installation and operation is a breeze. The lamp gets broken easily. This does not support a Bluetooth connection. If you have lots of gadgets at home, this projector is recommended for you as it allows you to connect them easily. You will enjoy watching movies and playing games even in the daytime as if you are in a cinema. A projector or anything that produces constant low sounds can be annoying to some and might cause in losing concentration. Do you easily get irritated by such? Then this might be the projector you need in your movie room. Its whisper-quiet operation is an edge as you can enjoy long hours of watching or playing without hearing the projector whirs. It also has SmartEco Technology so that you will not worry about your electric bill. It has 2,200 lumens of ANSI brightness and 15,000:1 contrast. The lamp life can last up to 7,000 hours. It has a +/- 10% vertical lens shift. It is compatible with almost any video formats. This streams video games with no lags. It projects very well on gray walls. It is not as bright as others. This does not have an MHL connection. This is great for a room that is not more than 10 meters to give a superb quality display of videos. You can place it also anywhere with its keystone correction and with its whisper-like operation, you can focus on the movie you are watching. You may have dedicated the biggest room in your house to be your entertainment area. This projector might be the one you need. This projector claims that it can throw vivid videos up to 19 ft. You can easily connect any game consoles such as Playstations or Xboxes. It supports 1080 HD videos. This has a long projection throw of 6.65 ft. up to 19.6 ft. The lamp lasts up to 30,000 hours. This is great in a big space. It includes an HDMI cable. Its fan is still noisy even though set to noise reduction mode. You have to manually adjust it to raise or lower its project. You should consider this projector for your spacious entertainment room or office. With its powerful long throw projection, all your audience will surely see your movies or presentations. It is very helpful to have a projector that you can directly connect your USB stick to it as you can easily plug it in and play a video. Aside from a connection to a laptop and a DVD player, you can also plug your USB stick, SD card, Amazon Fire TV stick, and most gadgets. The lamp life is expected to last up to 50,000 hours. The contrast ratio is 2000:1. It has a maximum display of 170”. The unit comes with a remote, adjustable stand, and necessary wires. It is compatible with any video format. The sound quality is not audible beyond 5 ft. It is not compatible with MS office apps. This may not be the option for people who are presenting reports on Powerpoint or spreadsheet, but this is great who loves watching shows and movies. Experience hassle-free connection using your laptop, smartphone or any external storage device. Are you planning for a retro-style entertainment room? This projector will fit in your theme. This projector looks more stylish than the other projectors you can see. It is equipped with a Dolby speaker and dual fan design. One can connect their game consoles via USB, HDMI, and jacks. The contrast rate is 2000:1. It supports all major multimedia devices. It is equipped with Dolby sound and dual fan design. The proportions and clarity of the image and videos can be adjusted without losing the quality. The audio quality is very good and clear. It is compact and lightweight great for taking it on travels. Some find it difficult to set it up. A few say that the picture quality is below average. This might be more on the aesthetic side than the quality. You can still enjoy playing video games and watch your favorite films but not as crisp and clear as the known brands. Not all projectors cost an arm and a leg. Do you know that you can have a theater-like experience in your home below $100? See more about this projector. 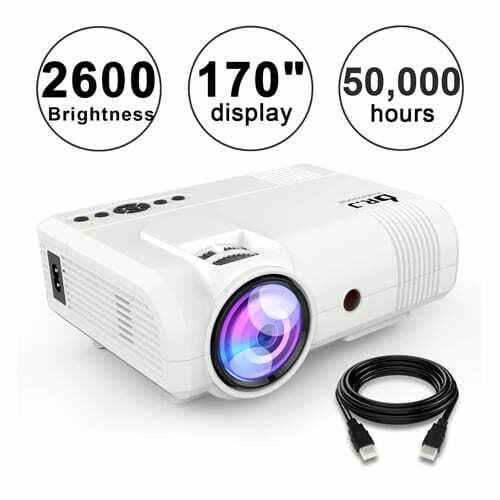 It is not hard to notice that the price of this projector is the lowest that you can find. Not only you can watch movies, stream videos, and play games but also view photos. This has a cooling system. It has inputs for HDMI, game consoles, DVDs, televisions, etc. It has 4 projection modes – front, rear, front ceiling, and rear ceiling. It is undeniably the most affordable projector. This works excellently on almost all types of video formats. The buttons are straight on for their functions. Some are not satisfied with the picture quality. A few experienced that the audio is cheaply built. You do not have to save a lot of money to build your own movie room. With just a hundred bucks, you can buy a decent projector. If you want it to be more a cinematic experience, buy a good set of speakers to complete your entertainment room. Are you looking for a projector below $100? Look no further for this product will not burn holes in your wallet. The simple, black design of this projector looks neat and clean. The LED lamp used is energy efficient thus will let you spend more viewing and playing hours. The resolution is 1280×800, a contrast ratio of 3000:1, and the dynamic up to 10,000:1. It has 2 HD ports and can connect easily to a computer or a television. It has a 15-degree keystone correction. It is more compatible with Powerpoint compared to other projectors. It projects videos very good at 10 ft. The colors are vivid and bright. The remote does not work or gets broken after a few times of use. It produces noisy sounds when operating. If you will most likely use it in playing intense games or in watching action movies, you can live with the humming noise of this projector. It has a good color resolution that you will love. Do you and your friends love spending Friday nights with Netflix and chill? You do not have to huddle around a phone but connect it to a projector so all of you can lay down and watch. You do not need to buy extra accessory cables to connect your phone to this projector as you can use its charging cable as a connector. This also has a noise-reduction and cooling system to let you finish a couple of movies without an interruption. The life of the lamp can last up to 50,000 hours. It is compatible with any latest smartphones, tablets, TVs, and laptops. It has built-in stereo speakers. The colors are vivid and vibrant. The projection angles can be adjusted. You can enjoy playing your mobile games on a big screen. It cannot open documents, Powerpoint presentations, and spreadsheets. This can be a great addition to your home in entertaining your family or guests as you can easily watch a movie or reminisce a video taken from your phone with just your regular USB cable. Are you still in search for a projector that is below $100 and an Amazon’s Choice? No need to Google it for this is the projector that you are looking for. This Amazon’s Choice projector was listed for $110 but is now on sale at $64.99. This can project from 32” 176” screen size. It also has built-in speakers so you can enjoy watching movies immediately after setting up the unit. It includes a warranty for 3 years. It has an advanced color technology for brighter and sharper videos and images. The price tag of this projector is affordable. It has a remote control included for an easier pause and plays. The unit is compact and lightweight great for placing moving it from room to room. Movies played on a USB stick does not produce sound. The projection angles are very limited. Though it does not produce excellent audio quality, for its price, you can buy a mid-range speaker to set it up with. This will surely you give you hours of fun times watching your favorite films with your friends and family. Should You Go for a Television or a Projector for Your Home Theater? With hundreds of LED televisions and state-of-the-art projectors, you might find it very hard to decide which of the two should you buy for your home theater. Here are some of the similarities and differences of a TV and a projector. Price – Of course you would want to buy a very good home theater appliance whether it is a television or a projector. A big and wide television usually costs $4,000 while a very decent projector only costs around $1500. 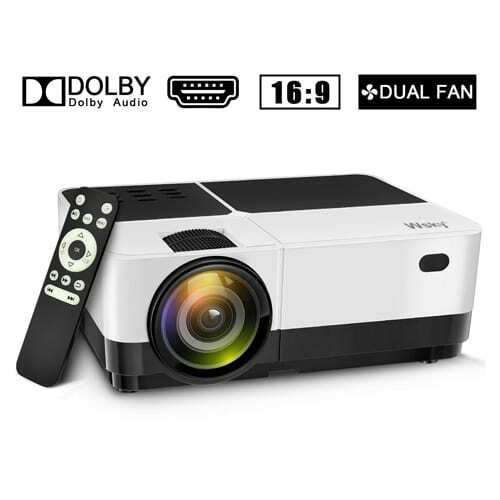 From their prices, it is better to choose a projector for your theater room especially if you are tightening your belt and you intend to use that room for watching movies. Resolution – Most high-end projectors have 3D technology like televisions and both have 4K image resolution. As you remember, projectors do not produce audio compared to TVs that even use the most reputable audio systems. Getting a television is a good idea for smaller rooms as the sound quality it will produce is enough to give a cinematic feel in a cozy space. But if you have a spacious room, it is better to go for a projector and a sound system for a more better watching experience. Accuracy in Color – It is nerve-wracking to see your favorite superhero’s costume is pink and violet rather than red and blue. Some low-quality televisions and projectors are poor in delivering colors and contrast. Look for a television that has a wide color range and high lumens power in projectors so you can really see the true colors of what you are viewing. It is advisable to check the area of your room before purchasing a television or a projector. This will help you decide much easier and you can prepare yourself in saving up money for your home theater. You might have noticed that the projectors in this 2019 product review are much better than the ones from the top projectors 2015 list. That is how much our technology greatly makes an improvement in giving entertainment to people. Decades ago, people needed to wait for traveling entertainers to watch a performance or invent a game to entertain themselves. One might have never imagined that having an entertainment room in a home is possible in today’s modern time. You cannot only use your projector in watching your favorite films but you can also use it to display your game and have it watched by your audience or have it placed in your office so you can easily present business proposals and close deals to your clients. Projectors are very useful to modern men and women most especially in watching your favorite movies numerous times.